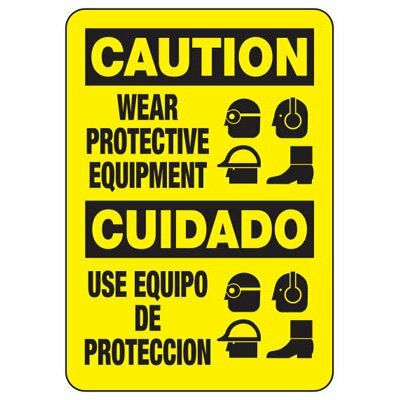 Post Protective Clothing Signs in locker rooms, on shop floors, in manufacturing or shipping areas if it is a requirement of the job. Protective Clothing Signs warn workers to hazards and the need to dress appropriately to avoid injury. Protective Clothing, items such as aprons, coveralls, safety shoes, etc., are important equipment for protecting the body from chemicals, sharp objects, acids and more. Protective Clothing Signs alert workers to put on their protective clothing when they are in contact with potentially harmful agents. Choose from Seton's selection of Protective Clothing Signs, including OSHA Danger Signs - Do Not Enter Without Wearing Protective Clothing and more.